Discussion in 'Land' started by DutchyGamer, Sep 16, 2018. 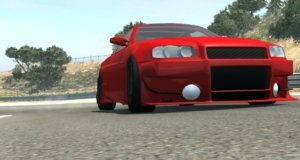 This thread is about porting the cars from Crashday to BeamNG! Release will probably be....probably 2020. I'm learning everytime as I work on this mod, which helps me add more things. Progress will still be slow though, I don't always have the time and/or motivation. Quite a while ago I had a stupid idea of meshslapping the Incubator from Crashday on to the 200BX. I shared a screenshot with the Crashday community Discord and they got hyped about it so..I guess I'll be trying to make this a real thing. Anyway, there's some old-to-semi-recent screenshots in this Spoiler tab below. All the cars will have every part and upgrades they have in Crashday. I have permission to use all the models, names and logos. I'm allowed to upload them to the Mods page whenever it's done. Model: Moonbyte and the original author of the cars, with my modifications. Incubator: Nissan ER34 mod by MaxGamer1995, with my modifications. Will it just be called Incubator? I've currently named it 'Moonbyte Incubator V12' ingame. Since the game (+ models obv) was made by Moonbyte. Incubator? Dr. Doofenshmirtz, is that you? Jokes aside, the project looks interesting, are you going to change the design? Nice going. 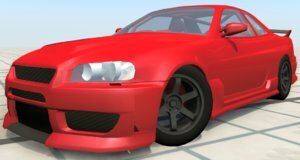 There needs to be a fake R34 Skyline in BeamNG. However, I don't really agree on the name "Moonbyte Incubator", since this is BeamNG. I would call it the Ibishu Miramar. Thanks, but I'm not taking any name suggestions, sorry. Tiny bit of materials/texture progress.. Most of that is probably going to be temporary as I keep trying to learn and figure stuff out. Oh ok. It still looks better than my crap lol. Yo, nice mod. I loved Crashday when I was younger. If you need any help with Jbeaming, textures, parts, or just anything in general... Send me a PM and I'll be happy to help. Great work and keep it up! Thanks, I'll let you know if I need help! Perfect progress. Will the car be mapped with Crashday materials? Hmm, I'll give that a try soon. Keep in mind these are just placeholders until I'm able to use the ones from the game (Crashday). Those bodykits look good! were they in the original Crashday game?